This is post 1a of 3 for diagnosing sacroiliac joint dysfunction. I haven’t been out of school for very long but I do know that most of the clinical diagnostic tests for sacroiliac joint dysfunction that were taught to me were also taught to some of you “veterans”. Not calling out any ages but there has been quite an upgrade in the literature over the past 4-5 years! I am writing this article to help rebut that many of those tests that we learned that are considered good for clinical diagnosis of SIJ as cause of low back pain and/or referred symptoms and show the best tests available. Most of the static & dynamic palpation and asymmetry tests that we have all used for years (standing/sitting flexion, Gillet’s, supine-to-sit, prone knee flexion, sacral springing, etc.) have been shown in the literature to have “poor” inter-examiner reliability, low sensitivity (0.46-0.49) and low specificity (0.38-0.64)1-2. Since these motion tests have shown to be too poor to use for clinical use, what is the best approach for possible reasoning that pain is of SIJ origin? The best evidence available to date includes the use of SIJ pain provocation tests by Laslett (2003, 2005)4-5 & Van der Wurff (2006)6. Before these studies, clinical reasoning of SIJ involvement arose mainly from pain below L5 surrounding SIJ and use of motion or palpatory tests. Laslett & Van der Wurff compared pain provocation tests of the SIJ (that produced familiar symptoms with compression, distraction or shearing of the sacrum on the innominate or vice-versa) with the criterion standard of fluoroscopically guided SIJ injection with anesthetic block. Even though SIJ blocks have been invalidated in one study7, it still is the criterion standard. Van der Wurff’s study was performed in a similar pattern but did not use sacral compression and instead used FABERs (and counted Gaenslens only once). The study basically agreed with Laslett that the battery of pain provocation tests can differentiate SI pain from other LBP pain. The +LR only indicates a “small increase in likelihood of the disease” based on likelihood ratio interpretation BUT it is the best evidence available and is not too bad for clinical diagnosis of the spine/pelvis. Do you use this evidence in your examination and if so, do you agree with the results? How else do you diagnose sacroiliac joint dysfunction? Freburger J, Riddle D. (2001). Using published evidence to guide the examination of the sacroiliac joint region. Physical Therapy, 81 (5), 1135-1143. Holmgren U and Waling K. (2008). Inter-examiner reliability of four static palpation tests used for assessing pelvic dysfunction. Manual Therapy, 13 (1), 50-6). McGrath C. (2006). 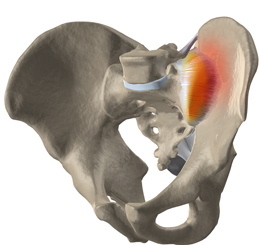 Palpation of the sacroiliac joint: an anatomical and sensory challenge. International Journal of Osteopathic Medicine. 9, 103-107. Laslett M., Young, S. Aprill C., McDonald B. (2003). Diagnosing painful sacroiliac joints: a validity study of a McKenzie evaluation and sacroiliac provocation tests. Austrialian Journal of Physiotherapy, 49 (2), 89-97. Laslett, M., Aprill, C. McDonald, B., Young, S (2005). Diagnosis of sacroiliac joint pain: validity of individual provocation tests and composites of tests. Manual Therapy, 10 (3), 207-218. Van der Wurff, P., Buijs, E., Goren, G. (2006). Intensity mapping of pain referral areas in sacroiliac joint pain patients. Journal of Manipulative & Physiological Therapeutics, 29 (3), 190-195. Berthelot J. Labat J., Goff B., Goulin F. et al. (2006). Provocative sacroiliac joint manoevers and sacroiliac joint blocks are unreliable for diagnosising sacroiliac joint pain. Joint Bone Spine, 73, 17-23. Cook C., Hegedus E. Orthopedic Physical Examination Tests. New Jersey 2008. Previous Entry Really JOSPT, another TrA article? Next Entry Physical Therapists Shifting Boundaries: Is There Going to be a Role Reversal? Interesting website, found ya from mikereinold.com. I read over it, and agreed with the Tra article. The SI jt notes were interesting. I usually find Gaenslen’s test to be positive bilateral. I also usually tend to find tenderness on palpation on the dorsal SI ligament. Other tests I generally use include nutation and councternutation, to check for ligmeant testing of Stuberous and long dorsal SI ligament. I also like to assess force closure around the SI joint, most importantly the post oblique system (glut med and Lats, together with thoracodorsal fascia. Great feedback and I do agree with you on your comments. How do you typically test nutation and counternutation? I will continue to add on to the clinical diagnosis with parts 2 and 3 in the near future. Nutation is the optimum stability of the sacrum, and one tests this motion by putting an AP force on the base of the sacrum, whilsts stabilizing Asis. (Base is distal to L5/S1) Counternutation is putting an AP force to the apex whilst stabilizing PSIS(very distal area of the sacrum). Patients with instability tend to have increased mobility with counternutation. Interesting Carl; never have measured instability in that matter. Thanks for uploading article. It is right we must find out the reason of being SI Joint before finding a suitable treatment for it. I often follow up with some of Brian Mulligan’s manual techniques for the SI joint. If I cannot decrease the symptoms with one of these mobilizations, I have to seriously question whether SI path is the problem. Good point Michael. If the symptoms do not respond to a valid technique, then probably not the issue.